Sargent Shriver passed away on Tuesday, at the age of 95. His is not a household name, at least to my generation. But it should be. Shriver established the Peace Corps. He launched and ran key programs of the War on Poverty. He worked with his wife to create the Special Olympics. Had he not lived in the shadow of the Kennedy family, whose political fortunes he worked so hard to promote, he might have been a successful office-holder in his own right. ...a good case can be made that Shriver, through the programs he started and ran, and through the generation of public servants he inspired, may have positively affected more people around the world than any twentieth century American who was not a President or other major elected official or Martin Luther King. I tend to think of myself as a pretty cynical guy. I am not easy to inspire. But Shriver awakened in me--just as he did in thousands of others--the notion that it is always worthwhile to work harder, to do more, and to dream bigger about achieving peace and social justice. A final note about his faith. The root of Shriver's self-conception was as a lay Catholic who always tried to model his life after the ethics of Jesus as expressed in the Gospels. This has not been a passive pursuit. Always he was asking himself, Am I living my life as Christ would want me to? What he derived from his faith was less the solace of Lord's presence, or the promise of transcendence in the hereafter (though he did derive both of those qualities from his faith) than a kind of mobilizing vision for action here on earth. It is telling that in the 1930s Shriver invited Dorothy Day to speak at his undergraduate institution, Yale. Shriver's Catholicism was in some ways analogous to Day's: rooted in the ethics of the Christian Gospels; dedicated to working toward peace, social justice, and redemption of suffering here on earth; and concerned especially with the easing the plight of the poor and the disabled. In some ways, Shriver and I were as different as can be: him an optimist about human nature, me a pessimist; him devoutly faithful, me a struggling agnostic. But I am nonetheless unequivocally sure of two things. 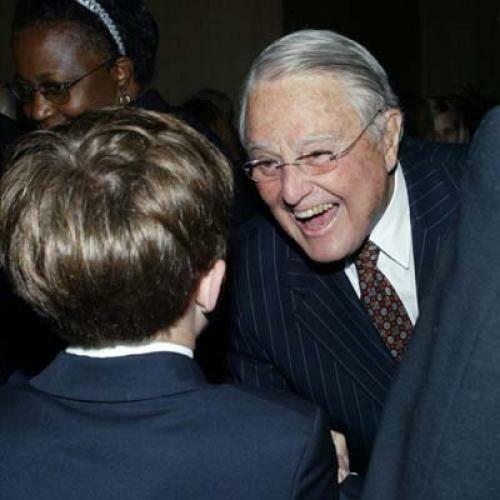 First, if there is a heaven, Sargent Shriver is on his way there now--or no one is. Second, even if there is no heaven, his legacy of good works here on earth is an inspiration and a goad for all of us to do more and better. Update: More thoughts on Shriver from Hendrik Hertzberg.